Metallography is the study of the structure of metals and alloys using various techniques, especially optical and electron microscopy. (1) Metallography is used to reveal the microstructure of metals, which is affected by composition, processing conditions including heat treatment and cold working, and post-processing variables such as machining, loading and welding. Service environment also affects microstructure and problems such as corrosion, stress corrosion cracking, carburization, sulfidation and a host of other effects can be determined from a material’s microstructure. Metallography is a key element in many failure investigations and often provides the critical evidence needed to make a definitive determination of cause of failure. 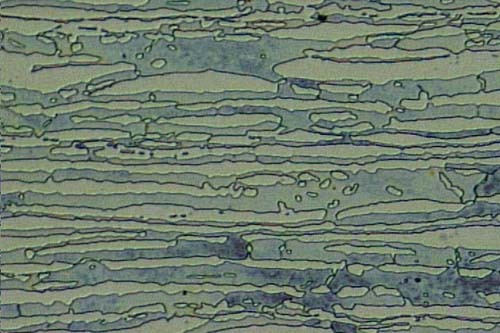 Microstructure of a weld used in duplex stainless steel, 2205, 250X original magnification. A color mixture of austenite, ferrite and sigma phases. 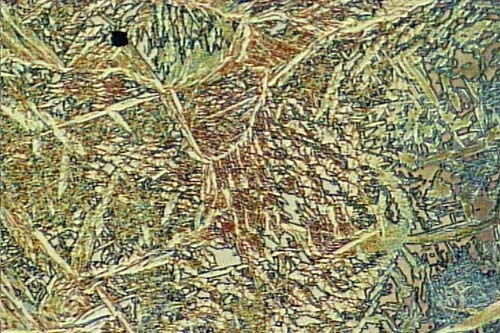 Microstructure of base metal of the same duplex stainless steel, 2205, 250X original magnification. Austenite phases are present as white island in blue sea of ferrite. Figure 3. 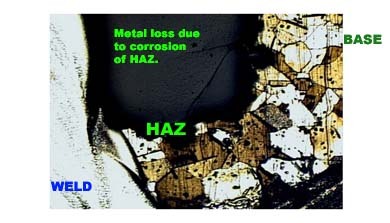 Corrosion at the interface between a weld and the HAZ (Heat Affected Zone) in Alloy 600. Etching reveals the grains and identifies the HAZ and the weld. In this photo, corrosion is occurring in the HAZ. The weld is not corroding. 63x original magnification. Etched by immersion for 30 seconds in a solution of 30% H2O2, HCl, and H2O mixed in a ratio of 1:2:3. A failure was discovered in the form of a through wall penetration in an area near a weld in Alloy 600. A metallurgical mount was made of the cross section through the weld, Figures 1 and 2. The specimen was etched in order to reveal the microstructure of the specimen in the area of the failure, Figure 3. 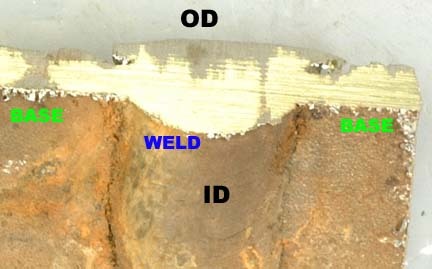 The HAZ (Heat Affected Zone) adjacent to the weld was corroding and the weld was not corroding. 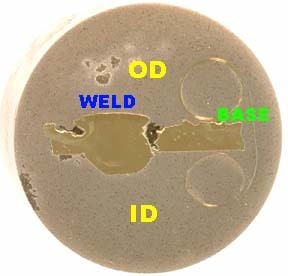 OES (optical emission spectroscopy) revealed that the weld was made from a filler material that was not in conformance to the customer’s specification. The use of improper filler material created the conditions for galvanic corrosion. Metallography confirmed that the corrosion was consistent with a galvanic corrosion mechanism – with the material in the HAZ being preferentially attacked adjacent to the weld. (1) ASM Metals Reference Book, 3rd Edition, ASM International, Materials Park, OH, 1993. (2) ASTM E 3 – 01 “Standard Guide for Preparation of Metallographic Specimens”, ASTM International, West Conshohocken, PA 2001.